The Soil and Water Assessment Tool (SWAT) is an integrated river basin model that is widely applied within the Nile basin. 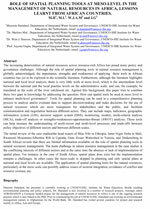 Up to date, more than 20 peer-reviewed pa- pers describe the use of SWAT for a variety of problems in the upper Nile basin countries, such as erosion modelling, land use and climate change impact modelling and water re- sources management. The majority of the studies are focused on locations in the tropical highlands in Ethiopia and around Lake Victoria. The popularity of SWAT is attributed to the fact that the tool is freely available and that it is readily ap- plicable through the development of geographic information system (GIS) based interfaces and its easy linkage to sen- sitivity, calibration and uncertainty analysis tools. The on- line and free availability of basic GIS data that are required for SWAT made its applicability more straightforward even in data-scarce areas. However, the easy use of SWAT may not always lead to appropriate models which is also a conse- quence of the quality of the available free databases in these regions. 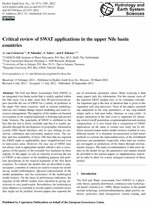 In this paper, we aim at critically reviewing the use of SWAT in the context of the modelling purpose and prob- lem descriptions in the tropical highlands of the Nile basin countries. To evaluate the models that are described in jour- nal papers, a number of criteria are used to evaluate the model set-up, model performances, physical representation of the model parameters, and the correctness of the hydrological model balance. On the basis of performance indicators, the majority of the SWAT models were classified as giving sat- isfactory to very good results. Nevertheless, the hydrological mass balances as reported in several papers contained losses that might not be justified. Several papers also reported the 20 September 2012 use of unrealistic parameter values. More worrying is that many papers lack this information. For this reason, most of the reported SWAT models have to be evaluated critically. 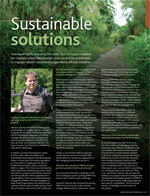 An important gap is the lack of attention that is given to the vegetation and crop processes. None of the papers reported any adaptation to the crop parameters, or any crop-related output such as leaf area index, biomass or crop yields. A proper simulation of the land cover is important for obtain- ing correct runoff generation, evapotranspiration and erosion computations. It is also found that a comparison of SWAT applications on the same or similar case study but by dif- ferent research teams and/or model versions resulted in very different results. It is therefore recommended to find better methods to evaluate the representativeness of the distributed processes and parameters (especially when land use studies are envisaged) or predictions of the future through environ- mental changes. The main recommendation is that more de- tails on the model set-up, the parameters and outputs should be provided in the journal papers or supplementary materi- als in order to allow for a more stringent evaluation of these models.